Transport infrastructure, shipment and distribution centres, duty-free areas, bonded warehouses, one-stop service facilities, single service inspection and customs checkpoints will all be part of the special economic zone. 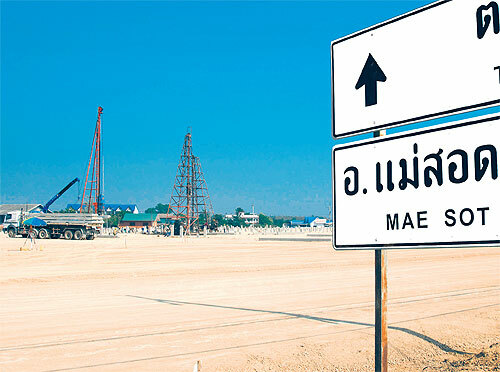 Trade figures illustrate Mae Sot’s fast-growing importance as a commercial hub _ border trade through Mae Sot checkpoint saw a surge of 80% last year to about 39 billion baht thanks to Myanmar’s first steps towards democracy and the relaxing of economic sanctions. The government also plans to build a second Thailand-Myanmar friendship bridge to straddle the Moei River. The town has one hospital, and Mr Prasert says it is inadequate to serve a larger population: ”We need two hospitals now, as many Myanmar migrants also use Mae Sot’s hospital, putting additional pressure on the local healthcare system,” he said. Mae Sot is in desperate need of more skilled workers, such as teachers, nurses and doctors. ”We can build the schools but we don’t have the teachers to fill them. While 20 new hotels had been built they were mainly offering ”budget accommodation” of around 40 rooms each to serve Thai guests, not foreigners. Sarot Lertwijitsap is the owner of the local Boonrot electrical supply chain, and has seen trade drop by nearly a quarter over the last two years. ”Myanmar represents as much as 60% of our weekly business here in Mae Sot,” he said. On top of this is competition from a new Tesco Lotus supermarket, which opened two months ago. Businesses find it hard to compete with what the megastore has to offer. But Mr Sarot is optimistic about the mid- to long-term future of his business. ”Things will settle and improve, because I see more Thai middle class people coming to Mae Sot. The new big highway will attract more Thais,” he said. Bebot Lameechanay, who works at Boonrot electrical store, said that he looked forward to the near future, especially as Myanmar continues to open up. He says that all the new hotels being built have been good for business. Mae Sot has an estimated 150,000-200,000 migrant workers and despite the city’s rapid growth they are seeing few benefits because of the ready and willing supply of cheap labour from across the river. And while Thailand increased the minimum wage to 300 baht a day, worker advocates say there is still room for widespread exploitation. In fact, the majority are paid as little as 60 baht a day. Ko Htway Naing says that it demand for jobs in Thailand is high, so employers can keep wages low and working conditions poor. ”Even if the employer loses an experienced worker, they can get 10 new workers for low pay,” he said, making it difficult for migrant workers to campaign for improved rights. The 2012 report, titled ”Surviving or Thriving on the Thai-Burma [Myanmar] border: Vulnerability and Resilience in Mae Sot”, noted that transient migrant workers often did jobs in the agricultural, manufacturing, construction, domestic work and fishing sectors; ”jobs that are often dirty, degrading, and dangerous”. He said that this was the case for many other workers in Mae Sot. For Ma Tway (not her real name) and many migrant workers like her, Mae Sot’s boom has done little to improve a precarious existence on the border. Ma Tway, 24, works in a sewing factory in Mae Sot and earns 100 baht a day. She works in Thailand illegally, and like many Myanmar workers, does this job out of desperation. When she first started working in Mae Sot, Ma Tway earned only 60 baht per day. After two years at the factory, Ma Tway received a 10 baht pay rise, and after three years she was earning 80 baht a day. Ma Tway and the other workers at the factory were forced to live in a cramped compound filled with small bunk beds. Their boss would demand 50 baht a night for water and electricity. Because they were in Thailand illegally, their employer could constantly threaten them with deportation if they demanded better conditions. As city coffers swell, people like Ma Tway are being left behind. She is still trying to get her work permit and passport. An estimated 1.2 million migrant workers from Myanmar have been registered by the Thai government so far, and Myint Thein estimated that more than one million are still to be processed. He also estimated that migrant workers from Myanmar are accompanied by as many as 200,000 children, around half of whom were of school age. Thailand has set up 11 one-stop service centres for unregistered migrant workers in cities throughout the country to facilitate the process and Myanmar has dispatched officials to assist at all of them. These nationality verification centres have the capacity to service 500-1,000 migrant workers per day, Myint Thein said. The cost to a migrant worker for all the documentation they need to legally stay and work in Thailand is around 3,500 baht. Myanmar’s ambassador to Thailand, Tin Win, said that the cost of obtaining documentation in Thailand was too high for migrant workers, with some having to pay as much as 15,000 baht. ”The actual process should not be expensive for the workers, but some have to pay brokers,” Tin Win said. He urged Thai authorities to ensure that brokers in Thailand didn’t exploit migrant workers from Myanmar. Mr Adisorn said that daily workers _ those that don’t usually stay long in Thailand _ were often found in the most high-risk jobs, such as construction and manual labour. ”We know of daily workers being crushed loading containers on the river,” he said. ”Even if injuries, like chronic back injuries, don’t surface until 10 years later who will pay for their treatment?” asked Mr Adisorn. Many of the injuries are easily avoidable, but due to the employer’s ignorance, or carelessness, they continue to occur everyday. This article appeared first in Bangkok Post on 17 February 2013.